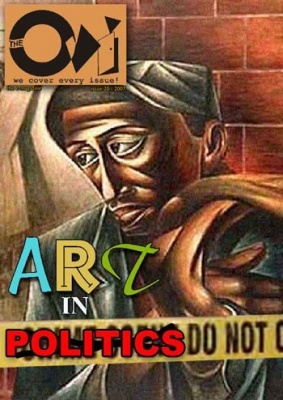 Art in Politics - Symbiotic or parasitic? When you were young, before getting on this cynical carousel we are all in, I’m sure there were moments you imagined that there are no countries, nothing to kill or die for and that all the people live in peace. I have and sometimes I still do, you see I’m a dreamer, but I’m not the only one, just hope someday you’ll all join us and the world will be as one. Of course these are not my words or better these are my words just John Lennon expressed them much better than I would have ever done, he added music as well and often sang it. John Lennon made art with a political statement. One of the most dramatic moments in European history of the last century was the bombardment of Guernica from the Nazi forces, they literally flatten the city killing thousands and destroying a beautiful city. Some years later Pablo Picasso painted the memorable Guernica making a simple statement, a political statement, never again. In this painting where surrealism meets cubism and reality, there is the death of the people and the history of a country not just the town from the worst the humanity had seen till then. So what the relationship between art and politics? Symbiotic or parasitic and even worse, in this relationship who is the symbiotic and who is the parasite? This is the third time I’m writing this article or at least I’m trying to do so and every time the same question drops and it’s always coming after an example. After thinking of Bob Dylan and Verdi for example I was sure that it is a symbiotic relationship but then contemporary news got on me to make me feel like it is parasitic. Reading that the US television superstar Oprah Winfrey is following presidential candidate Barack Obama in his campaign tour in Iowa it was seeing this parasitic role. Oprah Winfrey is known for her TV chat-show that sometimes reaches the limits of trash TV, however the very same woman in her past proved to be a superb actress in the film The Color Purple that nearly gave her an Academy Award. I’m not sure how I would call her today but her past for a lot of people show an artist. And this woman uses her TV popularity and her identifiable persona to promote a politician. Parasitically the politician is using all that to make sure his success! But again that’s one side; Bono uses his popularity, something he earned as artist, to save Africa or at least to show us what’s really going on in Africa. Politics again, but in this case Bono’s politics and art have a symbiotic relationship. Wagner was openly racist and perhaps you might have excuses thinking of the era and the semantics of the time, still Wagner was Nazis’ favourite composer, they loved Wagner so much that when they were sending their victims to the gas champers they were accompany them with Wagner’s music. Again art in the service of the parasitic politics. Please be careful I’m not regarding all politicians as parasites, on the contrary I was very happy when all Hollywood stars, writers and all kind of artists stood next to the democratic candidate against George W. Bush and they did so openly hoping that their public faces will give an end to this administration. And I don’t want to stop in what happens in USA today. There is an artist in Greece who has put himself at the service of the people and democracy after the WWII, Mikis Theodorakis. Mikis is a well known international composer and his career is well known, even for his more …pop style compositions like "Zorba's Dance". The same time the man has lived exiles, torturing even the firing squad after the civil war in Greece. A lot of his compositions talk about the people of Greece during these difficult times and a lot of them were composed while he was in prison. One of the most beautiful poems of the Greek Nobel awarded poet, Odiseas Elitis is about Cyprus and the unfair destiny of the island either under the British or Under the Turks. All these are political. I can go further; Vladimir Mayakovski was all about politics, all about the revolution until …he committed suicide disappointed! And it was Jean Paul Sartre, a supreme philosopher of the 20th century. Even further, Aristophanes; the ancient master of comedy where politics dominated every single of his plays and the Sophocles who writes for the beauty of democracy. But then with all the above examples is art that turns to politics in a symbiotic state and never politics that turns to art. When politics turns to art is to use art. The birth of the posters and graphics design stands in the Soviet Union and especially Stalin’s period. Major soviet designers at the service of the revolution, people who wouldn’t even dare to mention their names in these pieces of modern art. All for the glory of the worker. That doesn’t mean that the other side stayed behind, who had the inspiration of the poster, ‘I want you’ with the American marine …unknown! The only thing remaining is to end ones more with John Lennon lyrics, so it is Xmas, war is over! Mr. Kalamidas, your reflections on the issue of the relationship of politics to art are, metaphorically speaking, a rich intellectual cake which may take some time to digest. They have however spurred some preliminary ruminations in my mind which I’d like to share and perhaps dialogue upon. There is indeed an ambiguous existential nexus between politics and art. I’d like to briefly focus on the poet Dante who is the literary grandfather of innumerable poets and novelists (Silone and Kazantzakis jump to mind) and see how your insightful distinction between symbiotic and parasitic works on him. Dante immortalized himself by writing an epic that has become timeless. It is, and it will continue to be taught, in all the best universities in the world. What powerfully motivated the writing of the epic were complex political events having to do with the ecclesiastical and secular powers of the times and which led to Dante’s painful exile from Florence. The characters in the three other-worldly realms that Dante visited by Dante in his imagination are real political people who lived in Florence at the time and affected Dante’s life. Paradoxically, they too have been immortalized by Dante’s opus. There the relationship is clearly parasitic: ignoble and obscure political people who lived in Florence in the 14th century will be remembered for many many centuries. But this begs the question: what did Dante write about that made him immortal? The poem's timelessness has to do with Dante's uncanny ability to present in epic scope a total universe far vaster than anything explored by our space shuttle; that is to say, a Spiritual Universe. One of the great ironies in the history of modern science since the Renaissance has to do with technological progress paralleled by the loss of coherent spiritual cosmology to the point that the word soul which the ancient Greeks well understood now conjure up the sole of one’s shoes. While Dante would applaud the achievements of modern space explorations, he would not mistake its conquests with higher spiritual realities. He would insist that any kind of flight in space is merely reflective of an invisible flight of the imagination by which we comprehend God's hidden spiritual universe. What separates Dante's epics from others in the genre of the ancient, medieval, and modern eras is that the entire work takes place in another order of existence out of time and history. The setting of the poem is eternity and Dante himself remarks that his subject is the "state of souls after death." Whereas most other epics have episodes where the hero visits eternal realms of being, such as Odysseus's visit to the underworld in the Odyssey, the eternal dimensions remain a background action in most epics. Dante remarkably reverses the process. Eternity is the literal subject of the poem and Dante's cosmic imagination enables him to imagine various episodes of history from a timeless mode of being. Dante is the vital medieval figure who concentrates Hellenic doctrines of transcendence and the Biblical vision of eternity. He shows the relevance of the legacy for subsequent eras. His influence is incalculable for the modern world: without Dante there would be no "Twilight Zone," "No Close Encounters of the Third Kind," and certainly no "ET." All these actions inevitably find their way back to Dante who pioneered the art of a story rooted in eternity intersecting history. The fact that "ET" is one of the most popular movies of all time is evidence of Dante's enduring achievement and contemporary relevance. The same could be said for Silone’s and Kazantzakis’ novels. They are narrated presenting real people in real political historical situations but their background is the eternal; a timeless mode of being outside of time and space. And by that, Dante did not mean red men with a tail and horns or people with wings playing the harp on a cloud as the modern caricaturist of religion is apt to suggest. So my perplexity is this. While accepting the distinction between parasitic and symbiotic relationship between art and politics, is there not another relationship which modern man since Voltaire (Dante’s mimesis) has all but forgotten and yet remain vital to preserve out humanity? I mean the nexus between the eternal and the temporal. Is modern man still capable of imagining such a relationship; and if he is, does he conceive of it as symbiotic or parasitic? Could it be that consciously, or perhaps unconsciously, modern man continues to read and study Dante, a medieval man of 800 years ago, because he has a secret longing for a return to that lost nexus to which Dante can lead him? As I said, rumination, for now, put perhaps appropriate to the season we are in and leading to a viable dialogue. "The gloriously romantic universe of Dante and Milton, that set no bounds to the imagination of man as it played over space and time, had now been swept away...The world that people had thought themselves living in--a world rich with colour and sound, redolent with fragrance, filled with gladness, love and beauty, speaking everywhere of purposive harmony and creative ideals--was crowded noe into minute corners in the brains of scattered organic beings. --Edwin Burtt, in The Metaphysical Foundations of Modern Physical Science. Thank you for your nice reflections on the subject. I'm interested on the topic as well, wrote an article to Gallery magazine on the subject but it turns out it will only be published in February. Art can be a very powerful peace and love tool and, as such, it defies many politician's purposes, as most sold out their theoric beliefs to war and multinational companies' money interests. Art is an act of love, a giving act. I would say Love is the most revolucionary of all forces. Some politicians understood that, some people like Yoko Ono or Carmen Castillo (who used to be a party member and became a peace activist and artist, after an experience similar to Yoko's in some aspects) are aware that art can change much. Love is creative by nature, creativity is liberating by nature, and the last thing some politicians and business men want, in this world, is for people to be liberated/free. But it is not dangerous as they wish to spread. The fact that some artists defended hideous causes (like Mann with nazism) has more to do with personal character than anything else.